In search of the perfect promotional item for your company? You will inevitably come across premium and beautiful glass cups! While faience, ceramics or porcelain are a popular choice and continue to be, glass cups add a little something to the presentation. With their big advertising space and their low price, printed glasses are an optimal item to advertise your promotional message. Branded with your own logo or slogan, you can strengthen your customer relationships for the long term. With creative marketing concepts you will ultimately put your company ahead, all for a very low price. If low price on excellent promotional products is the goal, check out our selection of promotional coffee mugs, promotional thermal mugs, custom umbrellas and bags to make a great collection in addition to the glass mug. Glasses, coffee cups and espresso sets are a fundamental within the workplace and while often ceramic, these particular variations can help form the very personality of your business. We take comfort from the access to warm and cold beverages and it is nothing short of excellent to combine your own company logo with that very sentiment. It is a convenient placement and a clear one at that; printed cups & mugs continue to rise in popularity and this is no different in your place of employment, while plastic bottles do not invite a second glance; it’s all about glassware. You do not have to travel to the fresh waters of Puerto Williams in southern Chile and collect the purest water in a bottle to leave an impression if you can brand the carrier. Applying optical highlights that ceramics may not be able to, can meet your taste buds too, in its truest sense. The design and smooth surface speak for pure elegance and whether you treat it as a gift or incentive, these may just be the perfect advertising ambassador for your company by highlighting the colour of your contents. From your morning wake-up-coffee, the afternoon tea with friends and family to the warming mulled wine on cold winter days, the printed glass cups are not only versatile, but they accompany your customers through the day. Their practical character and beautiful design and natural elegance makes them an advertising item that inspires big and small enthusiasts. You could supply the full package by extra coffee/espresso set or tea cups from koziol, which is not only available in different colors, but is also equipped with a detachable, heat-insulating handle support. Cups are drinking containers with a handle. They are usually used to serve hot beverages and are made out of faience, ceramics or porcelain. But even these promotional classics can surprise you. You can find them in the allbranded online shop category ‘glass cups’. They can even be decorated with your personal logo or slogan. The glass cups as an optical highlight prove, ceramics or porcelain do not always have to be the first choice for material! Elegant and robust, they let you enjoy your hot cup of tea or a cool glass of juice. Although printed glassware will remain a simple user item, thanks to their premium and modern design they already have achieved the status of a decorative piece. Whether transparent or milky glass cups, with a logo print or engraving – each variety of personalisable glass cups is a real eye-catcher. Examples Of Custom Glass Cups & Bottles Being Used Effectively! It can be difficult to imagine how your business might use promotional products. Let us offer some examples on how logo printed glasses could be used to increase brand loyalty, raise brand awareness and even encourage sales of a new product being brought to market. So, you are a business that operates in the finace industry. You have powerful, exclusive and very important clients in your customer bank. How can you establish an even closer connection with them and ensure that they keep coming back to do business with you? Simple! Offer them a high quality whiskey glass embossed with your corporate logo. This will appeal to their soft side and everytime they find themselves sharing a glass of whiskey with a business partner or work collegue, they will be subtley reminded of your brand. At the moment you could be considered faily unknown as a business in the local community, but you have ambitions and the team behind you to be top of the competition? Great! By handing out customised glasses to locals, you can ensure that your logo can be found in the homes and offices of the entire community. As word travels and time goes on, your brand will benefit from potentially hundreds or even thousands of brand impressions. Simply by giving away free promotional glasses! Imagine that you are a popular nightclub or bar, releasing a signature new cocktail or drink to drum up the excitment of both the press and the public in regards to your venue. Why not send out a personalised tumbler etched with your brand design to the press! You could even include personalised invitations to an event unveiling your new creation and offer reporters and important figures a chance to taste your signature drink before the public. Who wouldn't want an excuse to go for a drink whlist getting a unique and interesting local story for their publication!? Printed glass cups can be found at every desk, in every office and at every promotional event. They are always there, not only in the working world but also in every home, which is why they are the perfect promotional products for you. A personalised glass cup in a stylish and contemporary design, given to your target audience, does not only make your company seem very friendly and generous, but can also have many other benefits. The probability, that a co-worker, customer or a business partner will take the glass cup home and use it there to serve coffee, espresso or tea, is very high. This way, your company will constantly be present in your target audience’s environment, being able to reach the eyes of other people. With printed glasses from the allbranded online shop, you will generate brand impressions for your company, increase brand awareness as well as strengthen customer or business relationships in your company environment. This will mean for you, your company the following: A positive advertising effect, with low cost, haptic promotional merchandise. Show your company to be worth the attention by acquiring corporate branded cups, to give out to your target audiences. Printed glasses are a real eye-catcher among the usual coffee mugs. Because of their transparency, not only are you eating with your eyes, but also drink with them. Our cups are made out of a double-walled borosilicate glass. They consist of two layers of glass, between which lies a layer of air. With the help of this design, the heat of the beverage is being preserved while the cup itself will remain cool and will therefore not burn your hands. With the printed glassware you will not only be able to display your promotional message beautifully but also the contents of the mug. 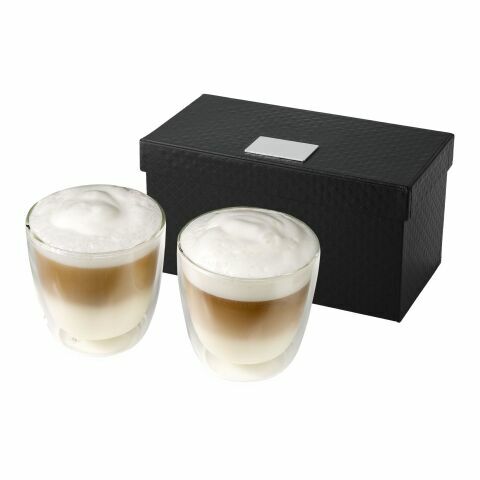 This variety of cup is especially suited to serve tea or latte macchiato. Next to the classic version, we also stock the so-called frosted cups, which have a matt and milkier looking design. Especially corporate branded cups with the frozen design have been very popular when choosing promotional items. This kind of popularity will enable you to advertise in a modern, modest and contemporary way. If requested, you can also order suitable saucers for your glass cups. Another aspect, which has to be considered for your marketing campaign, is of course, the advertising area on the promotional product, which will be bigger with glass cups, than for example pens. 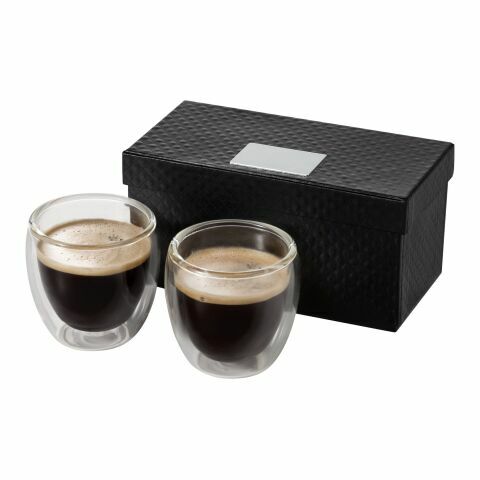 If you order these fantastic items, we can personalise the glass cups according to your wishes, to make sure, that the product will be in accordance with your company design. With these awesome promotional glasses, you will not only reach customers and business partners but also people in their environment. As the glass cup is an item, which is being used on a daily basis, you can be sure that the advertising effect will be very high. Among the large range of allbranded glass cups, you can find one renowned brand: Rastal. For almost 100 years, Rastal was and is one of the most popular manufacturers for glassware in the food industry and commercial trade. The family company has already risen to the status of a global player, and convinces with their longstanding manufacturing experience and innovative design. Rastal is one of the leading companies in this industry and their brand stands for trust and quality. This was also shown in a recent market survey, where 75 % of the people, leading a household, responded, that they believe Rastal is synonymous for quality. With printed glasses from Rastal you will therefore decide not only for modern promotional items but also for genuine quality products of an internationally recognised brand. Use the concept of brand transfer and see for yourself how the values and quality of the brand Rastal will transfer onto your company’s products and services. Rastal printed glassware, will offer you great user value. Personalised according to your corporate design, these corporate branded cups, can become a real delight. You can trust Rastal, to leave you satisfied. The glass cups can be personalised according to your corporate design or your individual requirements. With the help of silkscreen printing, you can decorate your glass cup with a slogan or your company logo with up to 6 different colours. But we do not only offer the printing method as a means to decorate your item. We also can engrave or cauterise your corporate branded cups with a personalised design. This way, your quality items will look even more premium and high quality and your brand is sure to be remembered. Our reliable team at allbranded will support you in choosing a suitable design for your promotional products. This way, you can be sure, that your end product will meet your expectations and your advertising message will reach your target group.